A few weeks ago, I had the pleasure to meet Manuela, an energetic Brazilian gal who has a true passion for handmade paper. 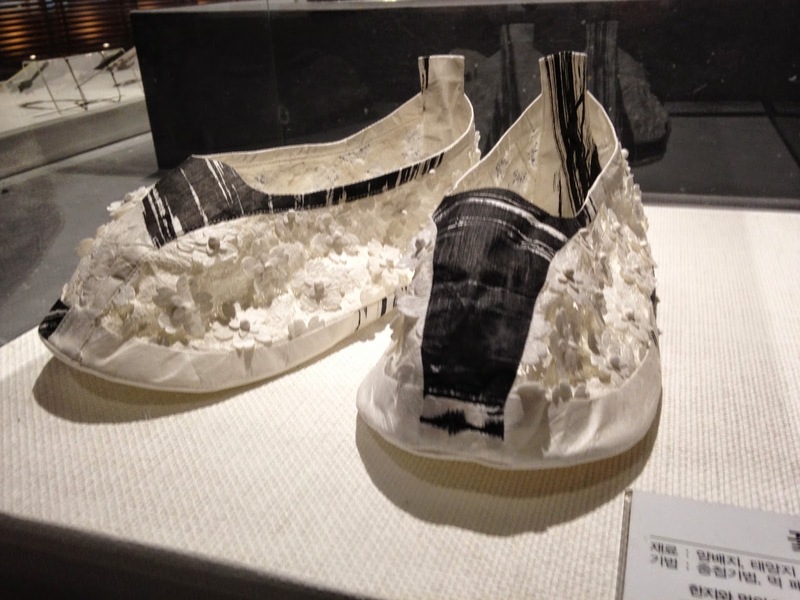 She is currently pursuing Graduate studies in a University in Japan, and her research focuses on traditional Japanese paper making. Manuela had the brilliant idea to contact me via this blog before coming to Korea on a 2-week vacation, to ask me for some suggestions on how and where she could get familiarized with Hanji paper while visiting Korea. I was thrilled to hear from her! After exchanging a few emails, we decided to organize a little meet-up in Jeonju, where we could visit the Hanji Museum together, and pay a visit to my beloved Korean Hanji teacher. The Jeonju Hanji Museum is located in the industrial complex, in the neighborhood Palbok-dong in Jeonju. It isn't the type of museum that you can naturally stumble upon while exploring the Hanok village or downtown Jeonju; you will most likely need to take a taxi or a city bus to get there (a link with directions to the museum can be found at the bottom of this page). The Museum is very beautifully designed, and the majority of the signage is translated in English, which is a rarity in Korean museums! It makes the visit very pleasant and informative for foreign visitors. The Museum also offers a comprehensive English brochure, and an English version of the "History of Paper" short video (projected on a Hanji screen in the Hanji History Hall) is also available. 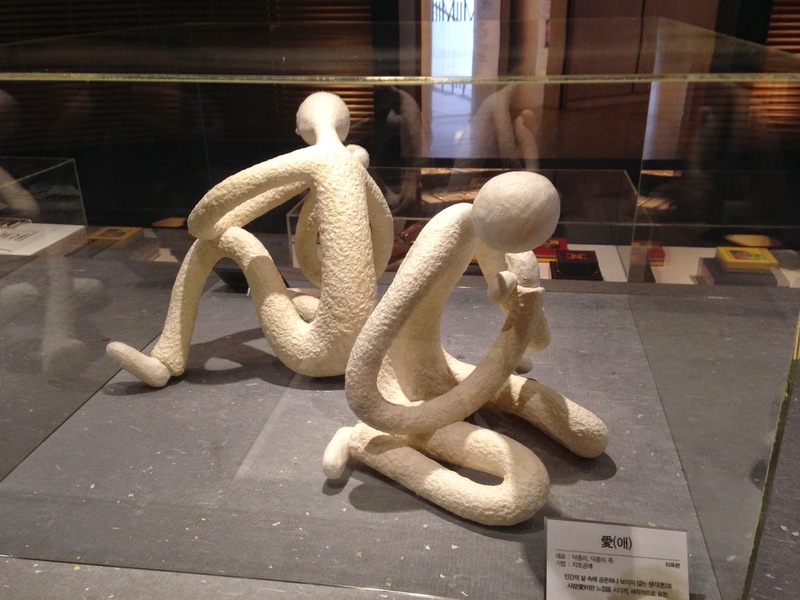 The first part of the Museum, called "Hanji History Hall", is dedicated to the history and evolution of paper, and more specifically, of Hanji paper. Some beautiful artifacts can be seen in that section, including very old Hanji boxes and pieces of furniture, antique paper scrolls, and calligraphy documents. in the Hanji Future Hall of the Museum. The second section, named "Hanji Future Hall", is devoted to the multiple uses and usages of Hanji. 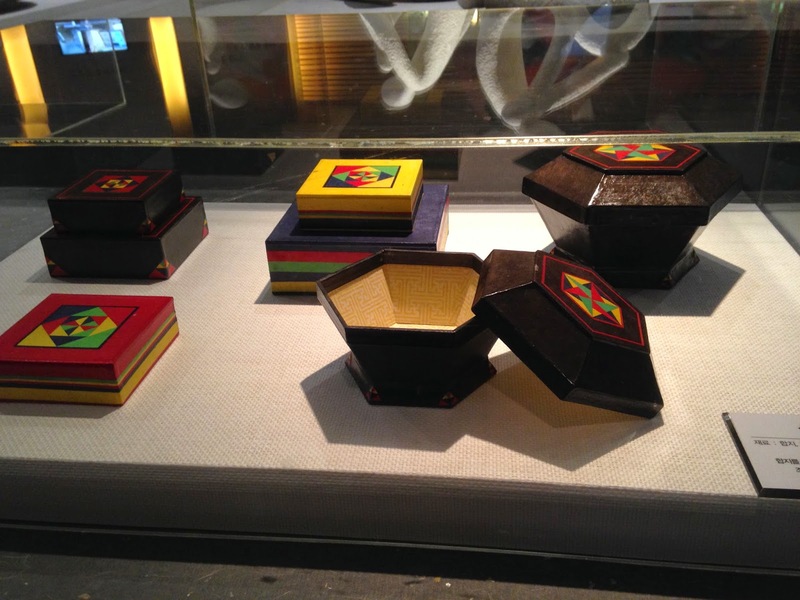 You will have a chance to see some outstanding products made of Korean Hanji paper paper, including clothing, artistic sculptures, hair accessories, scarves, vessels, dishes, decorative boxes, shoes, ties, handkerchiefs, etc. The range of items made with Hanji is truly amazing! The section of the Museum illustrates beautifully the multiple strengths and characteristics of this unique material. The third section of the Museum, called "Millenium Future Hall", contains a small auditorium (for video projection) and a space for workshops, and for welcoming groups of visitors. 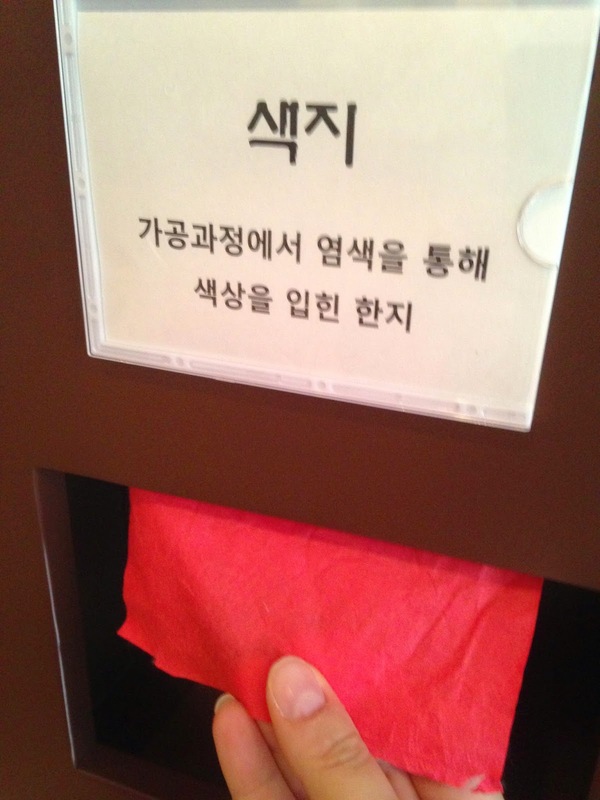 The different types of Hanji paper are also on display, and the visitors are invited to touch the diverse kinds of Hanji, to feel and see the differences between them. It is very instructive, but unfortunately the indications on the different types of Hanji paper are only available in Korean. The fourth section of the Museum is an exhibition Hall that welcomes temporary exhibits. When I visited the Museum back in September 2014, an exhibition of drawings by local university art students was there for us to admire. 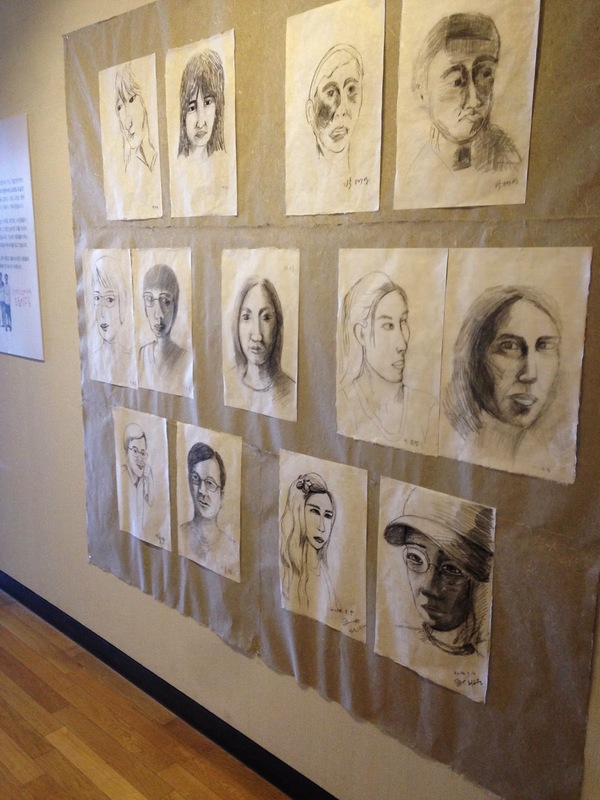 The students drew portraits on Hanji paper, and the results were truly beautiful! A lovely selection of complimentary postcards was also available for the visitors for the duration of the exhibition. To reach the fifth and last section of the Museum, called "Hanji Reproduction Hall", the visitors are invited to go down a "green house" staircase, under which different plants are happily growing. Visitors can see the beautiful green mulberry plants, the raw material at the very base of the fabrication of traditional Hanji paper! I felt that this brief walk in a very green and lively environment was a very nice touch in the Museum visit. 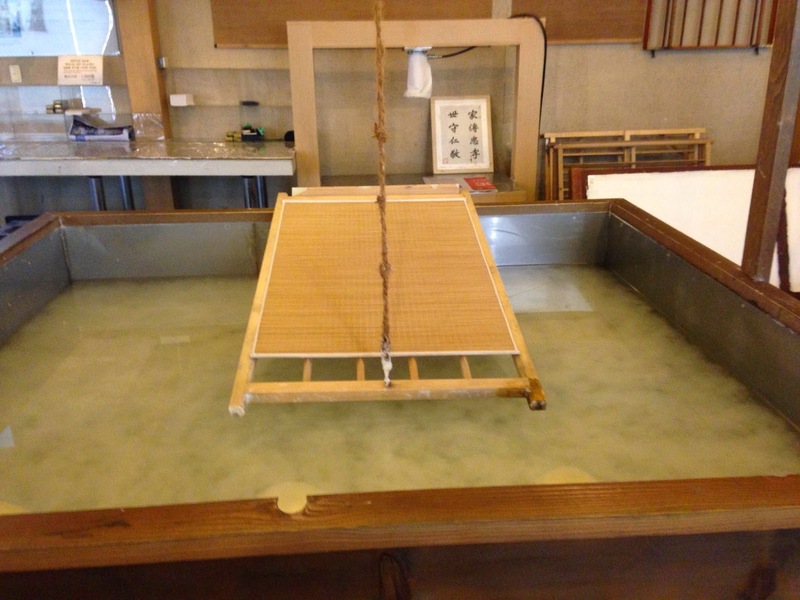 In the "Hanji Reproduction Hall", visitors have a chance to see and touch the raw material used to make Hanji paper. Every step of the paper making process is well explained and documented, and you can see the tools, raw materials and instruments used to make the paper. 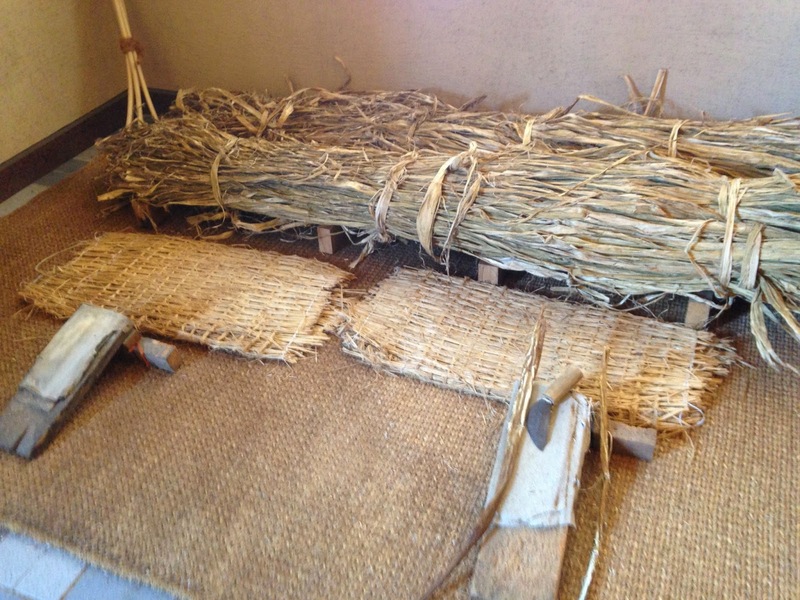 At the end of the path, the visitors are invited to make their own sheet of Hanji paper, using traditional techniques. 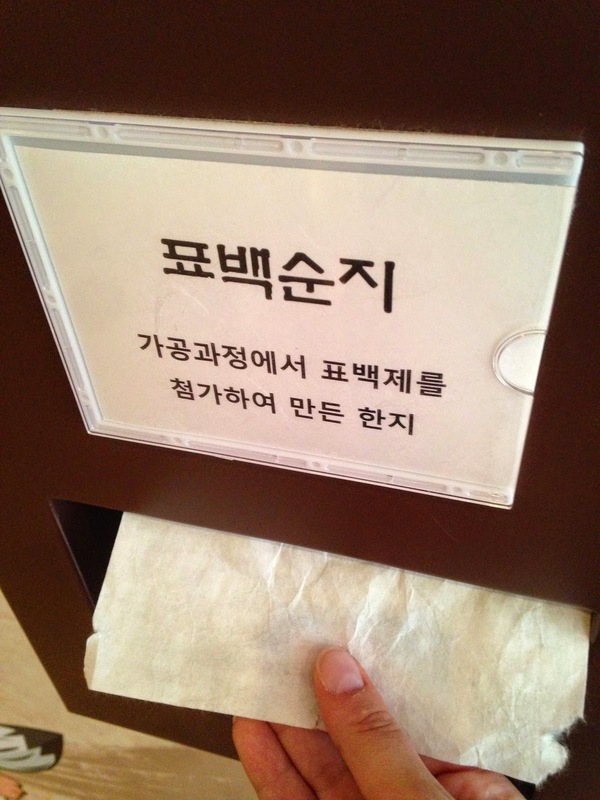 The Museum staff is very kind and helpful, and the hands-on experience is very pleasant! 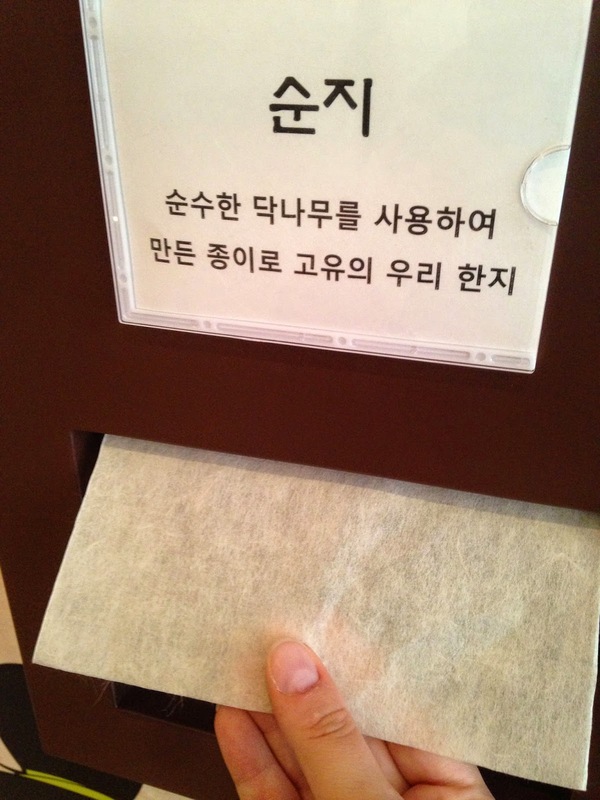 The visitors can keep their own sheet of Hanji paper as a souvenir. 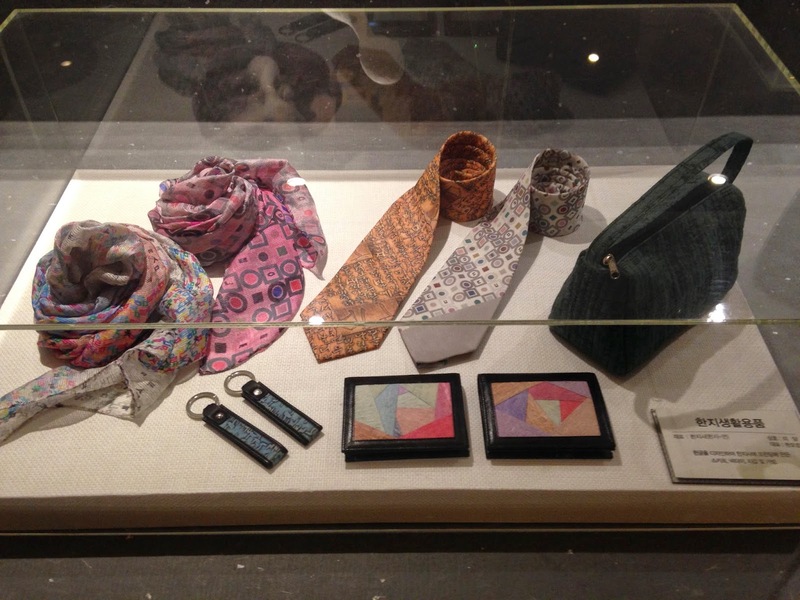 When the visit of the Museum is over, you can also browse in the nice Hanji Museum gift shops, where you can find a good selection of Hanji paper (sheets), as well as Hanji paper products: socks, fans, dolls, decorative objects, etc. The products offered in the Museum are of high-quality, and are reasonably priced. A great visit... and a new friend! 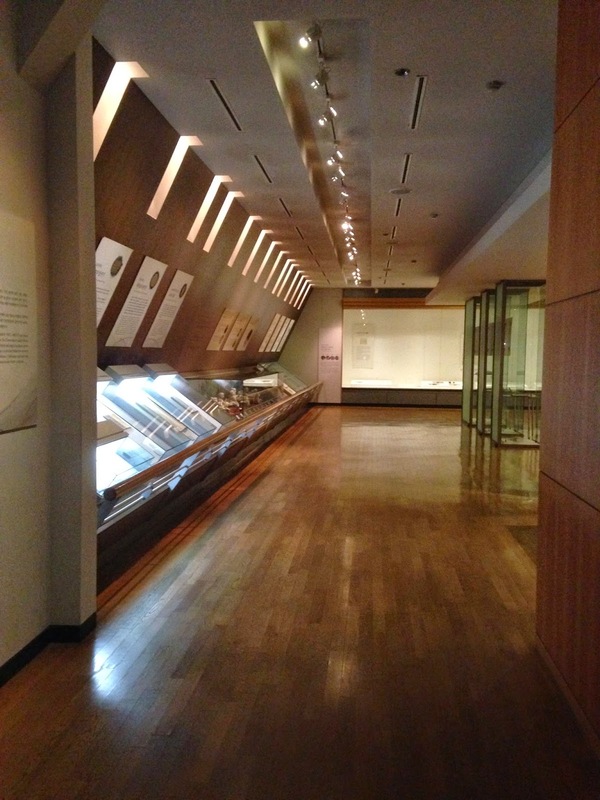 I had a great time at the Hanji Museum; the visit was interesting, instructive and fun. The whole visit took about an hour, and it was definitely worth it! I was thrilled to share my passion for Hanji paper with my new "paper friend", Manuela! It was very interesting and resourcing to spend time with someone who shares my passion and interest for traditional paper, and I walked out of the Museum reinvigorated and full of new ideas! Thank you so much, Manuela! I cannot wait for our next adventure... wherever that might be!